In spite of our efforts to contain the mint, it spread beyond its designated area. We planted three different varieties (spearmint, chocolate mint, Bergamot mint), one plant of each in different areas, and each is staging a takeover. The plants spread by sending out shoots along the ground as well as seeding, and they expand very quickly. We decided to experiment with containment by planting the spearmint in a large nursery bucket (with the bottom cut out to allow for drainage) and set it in the ground. The other two mints we planted directly into the soil. The spearmint had more vertical growth while the other two spread quickly along the ground. Though not a strict scientific experiment, the results made us decide to continue setting mint in containers before putting into the soil. Two weeks ago I went out into the garden, scissors in hand, and snipped the spearmint back into submission. By the time I finished snipping, I had three grocery bags full and the heady aroma of mint on my hands, arms, and clothes. It was a shame to wash it off. I gave away two bags of the mint and used the rest to make ice cream and jelly. Michael was not thrilled about either the ice cream or the jelly and asked me to not make too much, but I just figured that meant more for me. The ice cream recipe comes from Cooking with Shelburne Farms, one of my very favorite cookbooks. At Shelburne Farms they make the ice cream using their own mint, cream, and honey. You can’t beat that for freshness! I used our homegrown spearmint, though other mint varieties would be interesting to try, and followed the recipe pretty much exactly except I used a vanilla bean instead of vanilla extract. The ice cream is very smooth and creamy and is a joy to dish up, and I fell hard for the fresh flavor. And since mint and chocolate are a match made in heaven, I added some mini chocolate morsels towards the end of the churning. As for Michael, was he converted? That was the best compliment he could have given me. Adapted from Cooking with Shelburne Farms, by Melissa Pasanen with Rick Gencarelli. 1. Put the mint leaves and the sugar into the food processor bowl. Process until the mint is finely ground. If you do not have a food processor, put the sugar and mint leaves into a bowl and use a pestle to grind the leaves into the sugar. 2. In the medium saucepan, warm the milk, heavy cream, and vanilla bean (not the vanilla extract) over medium heat. Stir occasionally. 3. In the medium bowl, whisk the egg yolks until smooth, then add the sugar and mint mixture and whisk until combined. 4. When the milk mixture steams and is hot but not simmering, whisk 1/4 cup of the hot milk into the egg mixture, then whisk in another 1/4 cup of the hot milk. This helps temper the eggs so they don’t scramble when you add them to the hot milk. Take the saucepan off the heat and stir in the tempered egg mixture. 5. Return the saucepan to the cooktop over medium heat. Add the honey and salt. Cook, stirring, until the mixture is thick enough to coat the back of the spoon, about 5 minutes. Do not allow the mixture to boil. When you draw your finger across the spoon, it should leave a clear mark through the custard. If you choose to use vanilla extract instead of the vanilla bean, add the extract now. 6. Quickly set the saucepan into the large bowl filled with ice water to cool the custard. You can also pour the custard into another heat proof pan if you prefer. Stir the custard for a few minutes. Cover and refrigerate until completely cool, at least 1 hour and up to 24 hours. 7. Pour the custard through a fine mesh strainer to separate the mint leaves and the vanilla bean. Churn the custard in your ice cream freezer according to the manufacturers directions. It sounds delicious. I know what you mean about trying to contain the mint. When I start my house renovations I have to move my own patch of spearmint, which was nicely contained by two intersecting sidewalks before. I like the submerged container idea; I’ll have to try that. Andrea, I am a big fan of mint. I tend to use it a lot in my cooking. it adds such freshness to dishes. I have not however, ever had mint ice cream.Can you believe it? I am very tempted by your recipe. Unfortunatelly I do not grow my own so will have to pop out and buy some. I will be trying this recipe as soon as this afternoon. Lovely post, lovely photos. I’ll bet that ice cream was just wonderful with your fresh mint. Mine never does very well. I think it is just too hot here. Or, maybe I’m doing something wrong. If Michael does not want I’ll gladly take his share. I really like mint and chocolate pairings and in an ice cream it’s unbeatable. Mint ice cream definitely is among my favorite ice cream flavors! 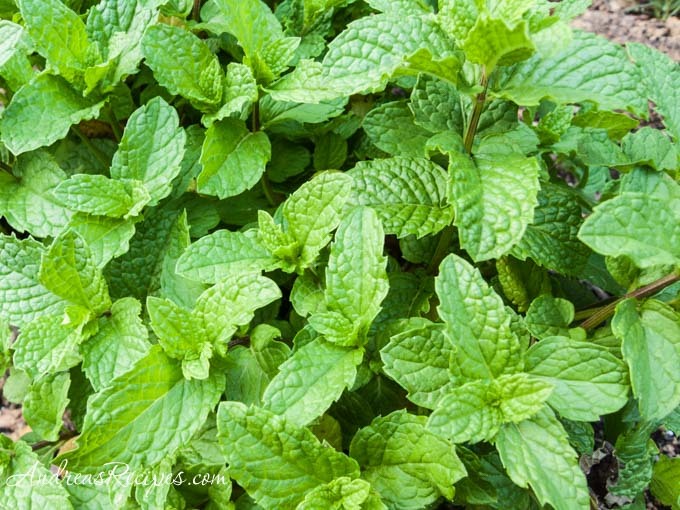 I’ve never tried making it with fresh mint before – but I’ve been wanting to try! My batch is in the fridge as I type this, doing its overnight chill. It tastes reeeeally good. (Good chefs are supposed to taste at every step, right? That’s my story and I’m stickin’ to it.) I’ll let you know how it turns out. Thank you for this recipe. I had never thought to use fresh mint before. It was absolutely delicious! I chopped up a bar of Ghirardelli Intense Dark Chocolate – Mint Bliss. The mint in the chocolate was a nice addition to the fresh mint and honey flavors. I will definitely make this again! Sara, I’m so glad you liked it! The mint chocolate must have tasted delicious with the mint ice cream. Hey Andrea, just wanted to let you know that this image has finally ended up on Skull-A-Day. Thanks for letting us share it! You can see the post HERE. HOLY COW!!! Literally!! That was UNREAL. The best I have ever made!! And I don’t like mint and chocolate together…Apparently I like fresh mint and chocolate!! Thank you for the recipe. I will be trying it out over the weekend. It sure does look yummy and I love your photo of the ice cream. Bet it’s going to be very good because I can already see two smilie faces in the ice cream. You know it will be when the ice cream is happy. 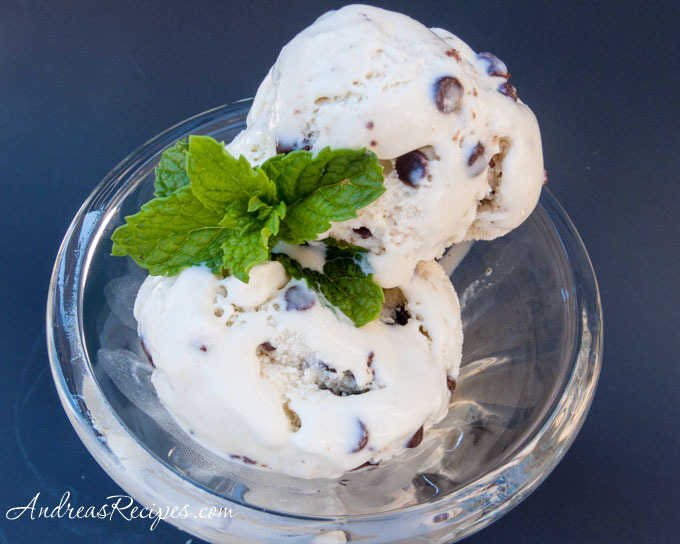 I, too, googled for mint ice cream and this recipe won. I am making it in a few weeks for my daughter’s 3rd birthday with one of our mint varieties – spearmint will most likely win. She’s my dark chocolate girl, too, so we’ll pick small chips to freeze in. Your blog is lovely. Thank you. the custard is now chilling in the fridge…I had a choice of four (perhaps five) different mint varieties growing in my garden. My three year old selected spearmint and picked the leaves ever so gingerly for the ice cream this morning. Will freeze this afternoon after we get the best chocolate money can but to freeze in. Tastes really good. The honey barks out, but I think it’s too warm yet. Has a pretty color.. greener than I thought it would be. we’ll see what comes after I strain it.